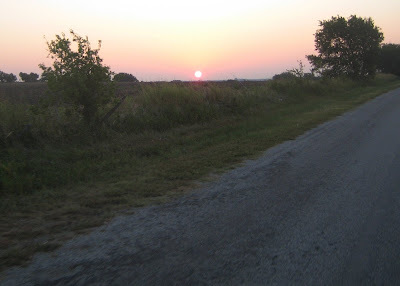 About 2 miles west of Valley View, Texas, at a nice, neat place that looked like this, the sun came up over the horizon. 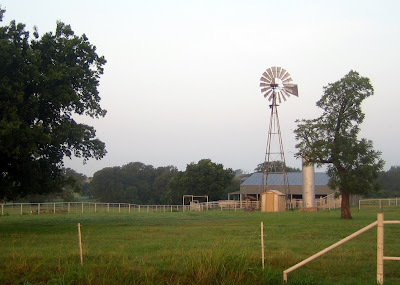 The air began to stir, and this windmill began creaking into motion. But this is not the beginning. It took a little while to get here. With an early start, there was time enough for a two-hour excursion before preparing for Sunday worship. There was just enough time to check one of the new routes I had in mind. Heading north into the dark, I could just see the eastern sky begin to lighten. With my generator hub and front headlight, I navigated easily over familiar roads. I knew there would be plenty of light by the time I reached the new roads. Good thing. Within minutes into new territory, I was on gravel. In the early morning light, I could see thin fog layers. The rolling terrain took me above, through, and below the fog layer at times. When dropping at speed into a fog layer, my bare arms actually felt a slight wet chill...a preview of the approaching fall, still weeks away. The gravel road slowed me down. Due to the constraints of time, it was necessary to quicken the pace. Making up for lost time, I expertly guided my machine across the loose, but smooth, surface. Dust flew behind and I imagined racing across the cobbles at Paris-Roubaix. I was uncatchable...at least until I encountered a short stretch of true cobbles. These larger stones were embedded in the dirt road and appears somewhat like the photos I've seen of the cobbles on that legendary race course. My machine and I were tossed laterally. We were bucked by some unseen Texas bronco and this more realistic Paris-Roubaix surface sucked speed, nerve, and pride right out of me. I soon realized that the only thing I have in common with those hardmen of the spring classics is the shaking of skinny arm muscles as the bike bounces its way along the roadway. Other than that, no comparison. 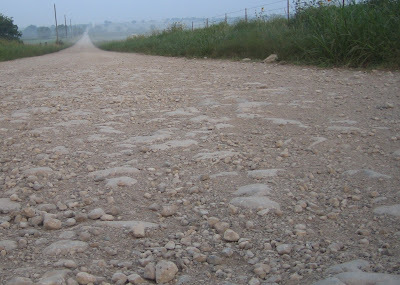 Thankfully, I only had a short run on the cobbles and even the gravel road soon transitioned into smooth asphalt...which brings us back to the west side of Valley View, Texas. 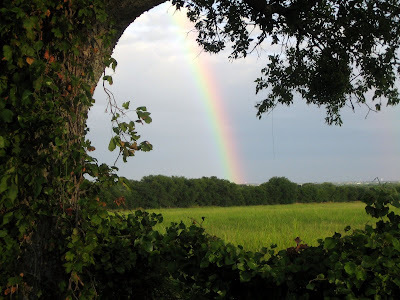 Coming into town, the sun was blocked by leafy branches of a large tree, but the golden reflection off the road looked like a warm welcome for a humbled visitor. I climbed up into town, turned the corner, and rolled down the middle of a still sleepy Main Street. By now, the south breeze spun the windmill steadily. 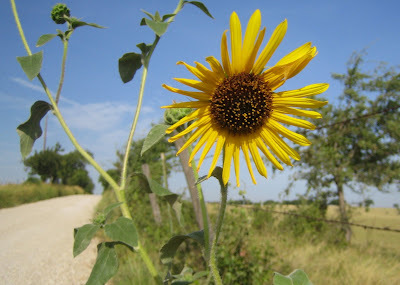 I put my hands on the drops, lowered my head, and pedaled into the wind toward home. I have said before that I am fortunate. 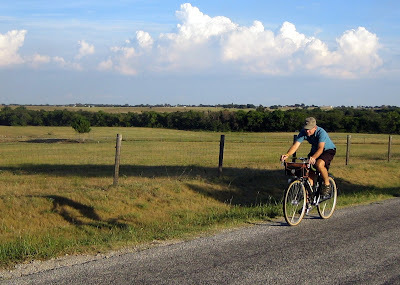 Living in rural Denton County provides the opportunity to noodle around on many low traffic and quiet roads. 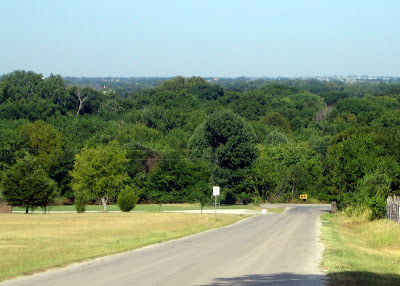 There is a nice combination of gently rolling hills and a mixture of paved and non-paved surfaces. 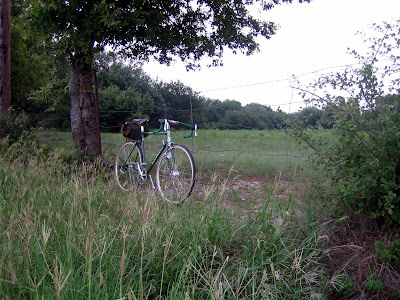 Since my rides are not long, however, there is a tendency to ride the same routes repeatedly. I've been thinking about trying to add variety by exploring new areas or venturing farther from home. What if time doesn't allow for more grandiose excursions? I am also fortunate in that I have multiple bicycles. My default ride is my Kogswell P/R fixed gear. 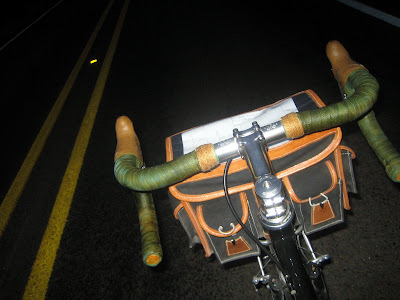 It's handling, front bag, fixed gear drivetrain, and cushy fat tires make it ideal for my normal ramblings. 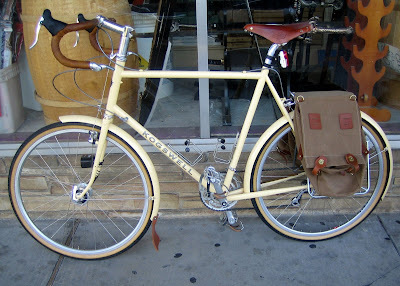 However, I have a Kogswell Model P that is also a very nice ride. Since it has higher trail geometry, multiple gears, and a different wheel/tire combination, it rides differently. Although the contact points for each bike are in a similar position, the Model P also has wider (and lower) bars so there is a slightly different feel to the cockpit. 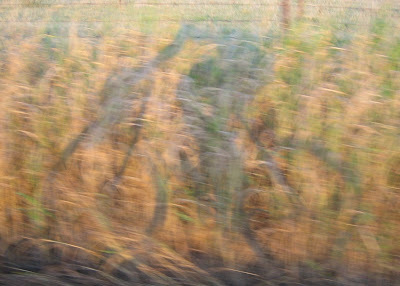 Variety today was gained by riding a familiar route with a different bicycle. Instead of standing to climb, I sat and spun small gears uphill, and then took advantage of the freewheel by coasting back down. Variety is good and I am still looking forward to exploring new routes. I even have a few areas in mind for when the opportunity comes. In the meantime, it's good to have options. After yesterday's early morning excitement, it has been a fairly slow weekend. Since I seek boredom, that means it has been a pretty good weekend for me. When I get back among my workmates, someone might ask, "How was your weekend?" To which I'll probably reply with the proven, "Fine. How was yours?" If I figured you were really interested, I might give you a couple of highlights. 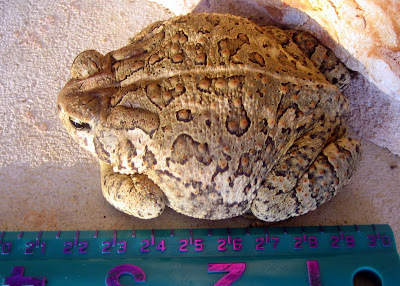 For example, I might tell you that we uncovered the large toad living on our back porch and measured his length-width ratio. Yep, I know, you can hardly wait. 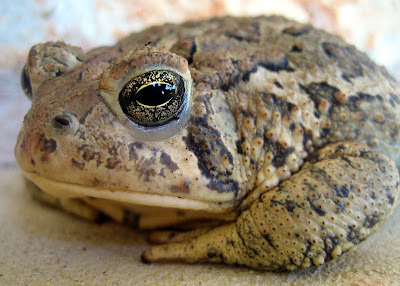 This fella feasts on the numerous insects that also frequently visit the back porch in the evening. 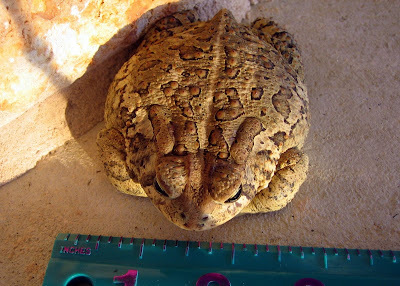 It looks like he is 3.5 inches long by 3.0 inches wide. That's a length-width ratio of 1.167-to-1, my friend. 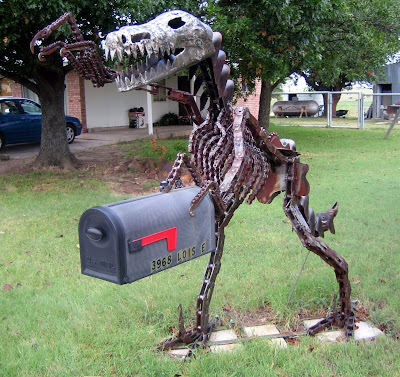 He doesn't look fast, but apparently, this guy doesn't go hungry. He has enough bulk to handle what the furry rascals dish out on him during their last patrol of the day. That's what we call a true win/win situation. So, yes, it was a slow weekend. But that doesn't mean it didn't have its moments. Even a slow weekend is better than bad TV. The rendezvous ride departure preceeded dawn. 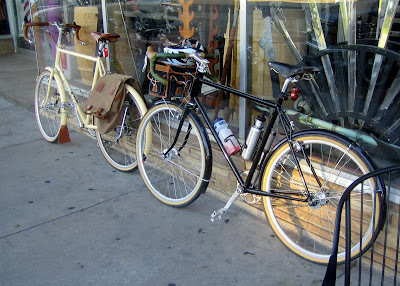 To meet up with my newest friend, Gene, at the Denton Square by 8:00am, pedaling had to start in the dark. 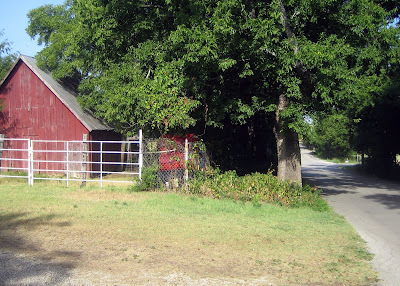 Since it is still pretty hot in north Texas, an early start is a good idea even with no appointment. Gene and I had our first encounter when he noticed my Kogswell Model P and asked me about it, months back. 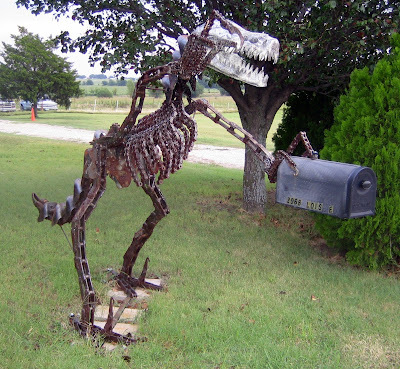 We chatted only briefly and I regretted not getting his name or contact information. Weeks passed and I posted my Kogswell P/R on the Fixed Gear Gallery, Gene saw it, and fortunately he resumed our conversation by email. It wasn't until today that we actually met and talked bikes. Schedules aligned and we decided it would be good to have a P/R rendezvous. He has the first generation P/R and I have one from the second batch. It didn't take long to see we had similar interests. We have both spent time riding racier bikes and wearing racier gear. 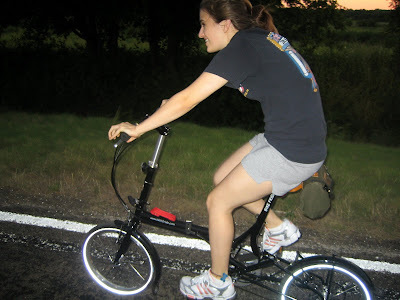 Lately, however, we've developed an interest in riding comfortably for the sheer joy of riding a bike. As such, we don't mind sacrificing extra weight for comfort. In fact, our conversation revealed that we both have an interest in bicycle touring. I think Gene's bike is delightful. Gene is not such a bad guy either. It wouldn't surprise me for us to meet up again before too long and get those two P/R's out on the road. 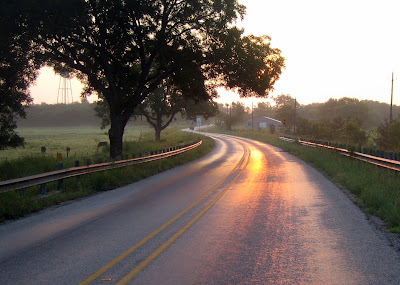 Because I like to ride a bicycle, I don't mind waking early to get on the road. During the prior evening, I fill bottles, check my food stash, and make sure I've packed the camera. Because you never know. Sometimes, when time is short, I'll noodle around on the bike just looking for something interesting to snap for this blog. Other times, it is really more about the ride, but I take the camera...just in case. Because you never know. This morning was one of those days I was able to get an early start. Today's objective was to explore a couple of new roads, but I had the camera, because...well...what if something amusing appears? How could I live with myself knowing that I did not capture it here for your amusement? To access the new roads I wanted to explore, I spent about an hour cruising familiar routes. As the overcast sky lightened, I slowly established a smooth rhythm. Not fast really, but steady. My mind went into that neutral state that blends itself with sustainable effort, the momentum of the undulating terrain, the alternating between sitting and standing, making the turns, and watching the countryside change. This neutral state of mind was interrupted, only briefly, when I noticed the new roads I sought to explore were gravel. Being short on time, I rode on by and deferred exploration for another day. Immediately, I was back in the zone. 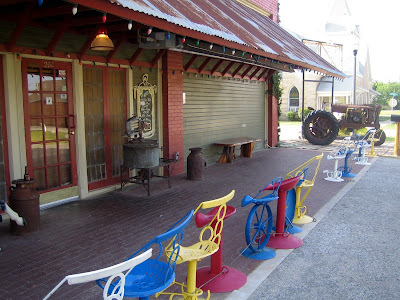 Like arriving at my destination and not remembering the drive, I rolled through Sanger focused on the feeling of movement and the joy of balancing on two wheels, but none of the details of the location. I guess I was there. I must have been there. On the north side of town, there is a hill. A medium climb, a wonderful view, and a sizable (for this area) descent. I reached the bottom of the hill going faster than my normal cruising speed, made the left turn and began climbing again. I stood and started the gentle rocking of the machine back and forth, establishing the balance of speed and cadence for my fixed gear. We were working together it seemed, my narrow world was in balance, and I glanced to my right and saw the Tyrannosaurus Rex standing by the side of the road. What?! 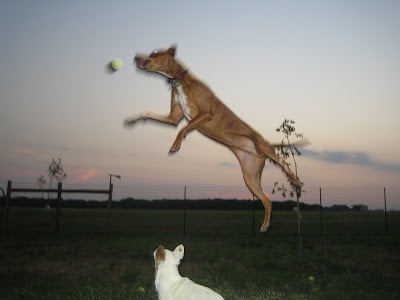 Momentum, rhythm, and balance all fade away as mind snaps back to reality. I lower myself back to the saddle and turn around. So today, I had the camera packed away in my handlebar bag because Mr. T-Rex had struck a pose. But I guess it could have been anything, really. You never know. My oldest daughter came to see me. Well...maybe she came to shop with her mother...or maybe she came to see the furry rascals, but at least she cruised around the 3-mile loop with her father this afternoon. Now that both of my girls are out from under my roof, I understand why parents enjoy visits from their children. There's a certain amount of pride to see them living independently, joy for times of reunion, and a twinge of sorrow when they leave again. This college senior is about to begin another fall semester. It was great having you here, my dear, come back soon. To my other daughter the Coastie...hey, girl,...it's your turn. Keep up the good work, come whenever you can. 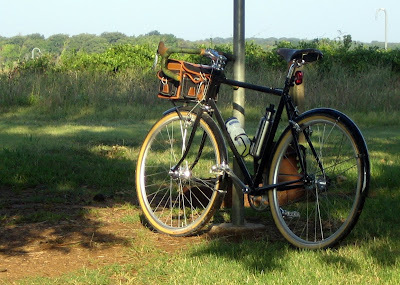 I was really content enough with the afternoon shower, cooler temperatures, and a few minutes to ride around the 3-mile loop (with fenders) on wet pavement. The view was a special bonus. 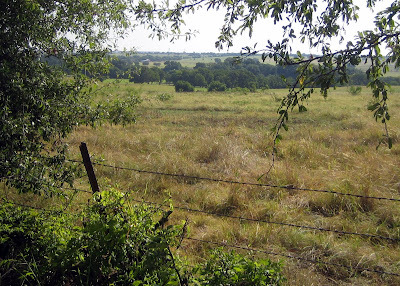 As promised, another Saturday morning ramble was launched so that I could further illustrate some of the interesting sights in Sanger, Texas. The ramble actually included accomplishing a few other minor tasks. It was bordering on efficient, but I was (after all) traveling by bicycle. Let's ramble, shall we? 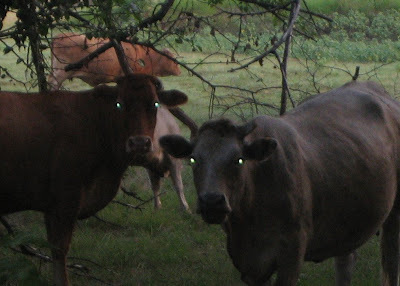 Once underway, it didn't take long to spot these demon-possessed cows. Those creepy eyes, even without coffee, woke me up. 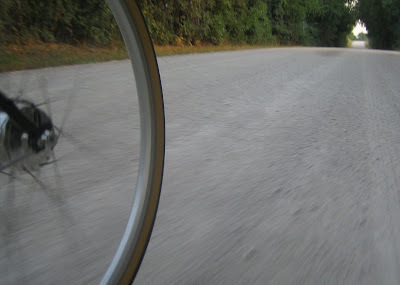 So I zipped briskly down the nearby gravel road. Approaching slopiness, it was time for a haircut. 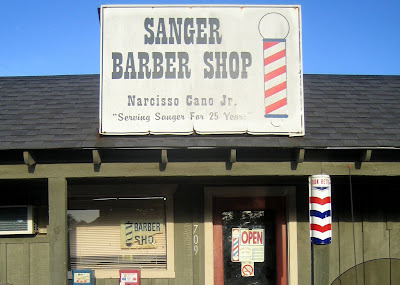 This was most convenient since one of the interesting Sanger sights (omitted from my last post) is Narci's barber shop. 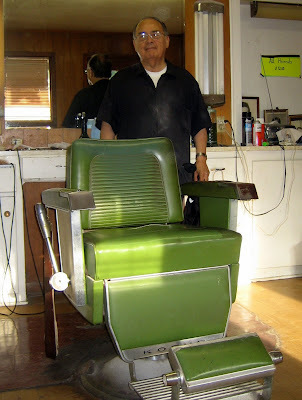 Narci is the scissor master of the one-chair barber shop in Sanger and an all-around great guy. He replaced the original 1920's vintage chair with this modern one built in 1963 several years back. Next stop, coffee shop. I had no coffee in the house this morning and was ready for my morning cup and a little extra to brew up later. 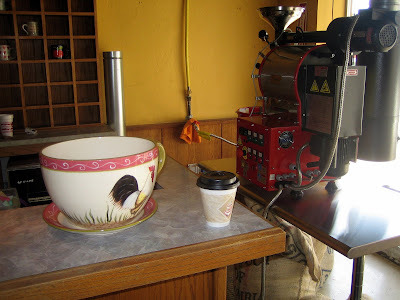 This photo shows (from left-to-right), Texas-sized coffee cup, standard coffee cup, coffee roaster. Yep, they roast 'em right here. 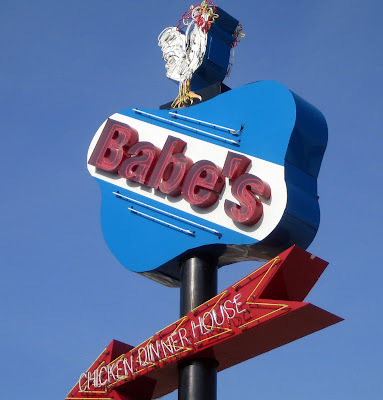 I'm a little surprised that I did not get a photo of Babe's during my last Sanger tour. This decidedly non-health food restaurant is one of the local claims-to-fame. Homemade bisquits, sorghum syrup, chicken fried steak, excellent singing waitresses, and the hokey-pokey. As a former Houston resident, I appreciate the sign hanging on an inside wall that says, "Life's too short to live in Houston". Come hungry. Come hungry and come early. If you come at normal eating times, you'll sit out here with many others admiring the tractor, salivating, and waiting to get in. 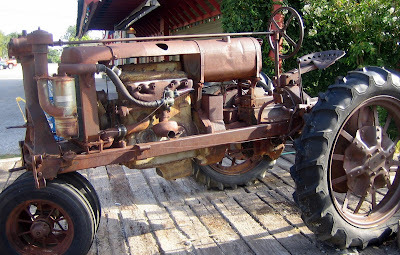 I just couldn't resist snapping a photo of this old tractor sitting out front. 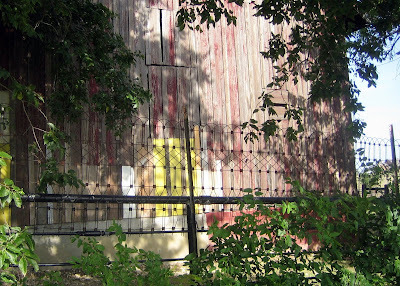 ...and this aged barnside with decorative fence, fading paint, and a few differenct colored boards to make it interesting. Let's see...bicycle transport, interesting sights, haircut, and coffee run. Yep, that is one excellent recipe for delicious Saturday ramble. 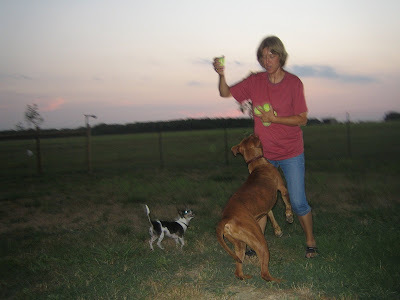 To my friends who might not be aware, I am an occasional contributor to another blog. 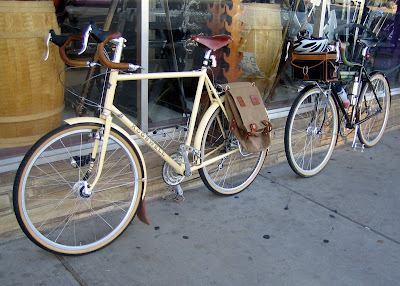 Veloquent, is the other blog and is authored by some of the finest bicycle bloggers out there. I begged to be a contributor and they humored me. I'm the high school social outcast being allowed to hang out with the cool kids for awhile. A few of my favorite prior posts from here were copied and included there. But I suggest you go to Veloquent to read posts from the other talented authors. It really has some excellent writing and has been an inspiration. 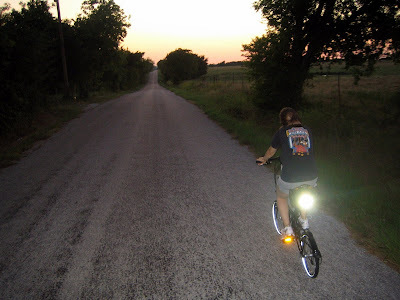 The name of my recent post on Veloquent is "Down in Texas". 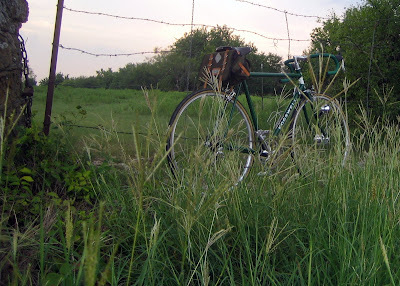 Considering the numerous ride reports included in this blog, photos of my bike leaning against various items around the state, and the Kent Peterson quote over to the right of this blog page, some might think I spend a freakish amount of time on my bike. Actually, I spend a freakish amount of time in a motorized vehicle, but I don't write about that (usually) because I don't like it. I like riding my bike, so that is what I talk about. Until today, when I checked the driving numbers. I did the math and quantification of what I'd been whining about to my beloved made it all the more real. It was a dose of reality that was difficult to swallow. I bought a new pick-up in the fall of 2007. In 9 months, I've accumulated over 30,000 miles. After doing the calculations, I realized that I average over 100 miles per day. That's every day, including weekends, for 9 solid months. I think a reasonable assumption is that I might average about 50 mph. A lot of my miles are interstate, but a fair amount are in town and in Dallas area stop-and-go traffic. If we assume a 50 mph average speed, that means I spend over two hours of every day driving. Two hours of every day, including weekends, for 9 solid months. I did the computation twice because I couldn't believe the numbers the first time. Kent Peterson, and other non-car-owners, are an inspiration to me and show what is possible. For me, it looks like I first need to work on trying to approach just an average amount of driving, then see if I can reduce further. I desperately want those two hours a day back. Given the limited length of my rides of late, today's pre-S24O reconnaissance activity might be considered (in my mind) an epic excursion. Even so, it was only 3.5 hours from start to finish. For those not familiar with the term "S24O", it is an abbreviation for "sub-24-hour-overnight"...which is also an abbreviation for "a bicycle overnight camping trip that takes less than 24 hours". The idea being that we don't always have lots of time to go camping, but we can squeeze in a very nice little get-a-way that doesn't require a huge investment in time...or lugging huge amounts of gear. One can depart after work on Friday, ride to a suitable camping spot, set-up a minimalist camp, relax for the evening by cooking, hiking, reading, etc. The morning provides an opportunity for lounging for awhile and a leisurely camp break-down for the return back home. I am lucky, because I have a suitable camping spot within an easy 2 hours (even with camping gear) of my house. Although I was hopeful, I didn't fully realize this good fortune until today. Today was the day of the S24O Reconn. Because of the excessive heat lately, it required an early start. It was very pleasant initially, but when the sun climbed over the horizon, it was as if someone flipped the heat switch to the "on" position. It wasn't really too bad out there. It wasn't until the very end, after the temperature had reached about 98 degrees, that I really noticed discomfort. Riding southwest into the wind, I thought, "This must be what it is like to ride into a giant hairdryer." Most importantly, the reconn trip was a success. 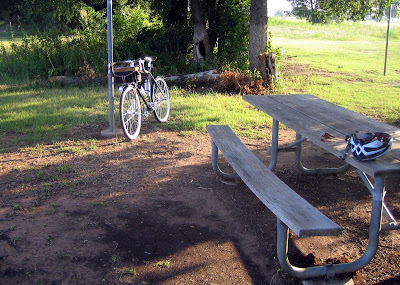 There is a Texas State Park on Lake Ray Roberts that has several suitable campsites on a peninsula that protrudes southward into the lake. That allows for the predominant summer breeze to blow lake-cooled air right into the tent. During late fall or winter, there are options for forested areas to break-up the north wind or open places to take full advantage of the sunshine. This nice little spot was a great place to cool off before returning home today. 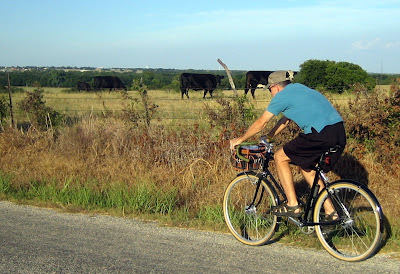 I've been trying to get my buddy, cyclist, and Sulphur Springs, TX resident, Keith to join me on an S24O near my house. 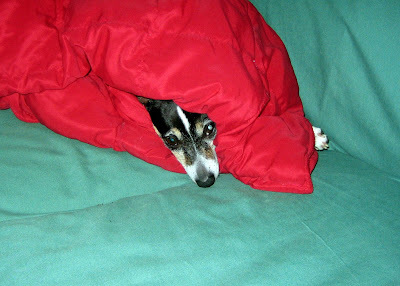 Hey, Keith, when the days get cooler, I know just the spot.